Collectively, archaeological research in the southern Levant has demonstrated a Late PPNB/Early PN cultural record east of the Jordan River that differs significantlyfrom other regions (Rollefson 1989, 1994;Simmons 1995a, 1995b). This has some intriguing implications for the trajectory of social relationships, which we feel were tied to the dramatic economic transformations that highlighted the latter phases of the Neolithic, at least in the eastern Levant. At 'Ain Ghazal, for example, where interdisciplinary investigations concentrated on obtaining paleoeconomic data, a wide range of domesticated and nondomesticated resources characterized the PPN phasesover fifty species were exploited. By the subsequent PN phases, however, diversity was greatly reduced, down to only three major species (Kohler-Rollefson and Rollefson 1990; Rollefson and Kohler-Rollefson 1989). In fact, data from many PN settlements illustrate a general deterioration in several aspects of material culture. Architecture becomes less substantial, chipped stone technology less sophisticated, and the artistic achievements of the PPNB are not matched (although see Garfinkel 1993:123-126regard-ing portable art). Thus, one has an overall impression ofPN life reflecting a generalized decline in the standard of living compared to the PPN (Kenyon 1960:60; Mellaart 1975:237-238;Perrot 1968:404-416). Even if Banning, Rahimi, and Siggers (1994:152-154) are correct in their assessment that the PN has been "devalued" by inadequate research and the low archaeological visibility of sites due to geomorphic processes, it still seems apparent that the considerable achievements of the PPNB were not carried over into this last Neolithic phase. Given these turbulent shifts, it is unlikely that extant social organizational systems escaped unscathed, although there has been relatively little direct research as to how it changed. Recent investigations at the large settlements east of the Jordan River have modified our perception of Neolithic developments in the Levant. We now know that these large Neolithic centers were substantially different from smaller Neolithic settlements situated closer to the Mediterranean coast and that huge settlements such as 'Ain Ghazal and Wadi Shu'eib represented unique desert-edge adaptations (Simmons 1995b).These settlements were initially founded during the MPPNB, with earlier developments (such as PPNA) apparently occurring primarily to the west (although the PPNA sites of Iraq ed-Dubb and Dhra',and a PPNA site near PPNB Ghwair I, are exceptions (Bennett 1980;Kuijt 1995;Kuijt et al. 1991;Kuijt and Mahasneh 1998;Finlayson and Mithen 1999). This population and settlement shift may have been linked to ecological changes and the depletion of local environments, with eastward relocation of communities facilitating the partial exploitation of new areas adjacent to the eastern deserts. Large sites such as 'Ain Ghatal may have attracted populations dealing with these environmental crises, resulting in a dramatic population increase centered within a few nearly urban centers (Simmons 1995b). This pattern is quite unlike that seen at Neolithic settlements further west, north, or south (see Bar-Yosef and Meadows 1995; Gopher 1994 for summaries). For example, many of the large settlements along the desert ecotone were occupied continuously from PPNB through PN phases and lack the presumed hiatus between aceramic and ceramic phases. Rather, an unbroken sequence exists, as reflected by the previously mentioned transitional PPNC phase. What is equally intriguing about these sites is that after the Neolithic they were abandoned, in stark contrast to Neolithic sites closer to the Mediterranean, where favored locales frequently were reoccupied after a hiatus from terminal Neolithic occupations (Simmons 1995b). (Rollefson et al. 1992:444-446), making it roughly three times the size of Neolithic Jericho. Wadi Shu'eiband Basta also exceed Jericho's horizontal dimensions. Although these sites are huge, they are not tells in the proper sense. They do not appear to contain deposits as thick as Jericho's, although test excavations at Wadi Shu'eib have demonstrated a depth exceeding 8 m. These settlements also do not contain early phases ofthe aceramic Neolithic. That is, there is no PPNA present, and even the PPNB deposits date from the middle to late range of that phase. Many, however, contain the transitional PPNC phase. These sites all appear to be abandoned after the Aceramic Neolithic. This differs from some of the western sites, includ-ingJericho, which was successively reoccupied, even after periods of abandonment. Unlike Jericho, massive architectural features (e.g., large towers or "citywalls") are not found at settlements east of the Jordan River. This does not mean that these were "substandard" or impoverished towns, as the material culture at the sites is extraordinarily rich. For example, nothing in the Near East has paralleled the exquisite 'Ain Ghazal statues (Tubb and Grissom 1995). Many of these sites are located in relatively fragile ecological zones, or at least adjacent to what might be termed marginal environments. As such, they just barely occur in what Bar-Yosef and Meadows (1995:73-74)referto as the "Levantine Corridor," a relatively favorable environment. 'Ain Ghazal, for example, is in a somewhat precarious ecological setting. Despite its proximity to a major drainage (the Wadi Zarqa), it is situated along the minimum (250 mm) rainfall isoheyt for nonirrigation agriculture, and desert environment is rapidly encountered just to the east. This may have been a crucial factor for peoples who subsisted to a large degree on domesticated plants. We can observe generally similar patterns at the other large Neolithic sites in Jordan, illustrating the importance of selected microhabitats along desert ecotones. This patterning stands in stark contrast to what occurred elsewhere during the PPNB and challenges us to explain this important regional shift. As an exploratory model, the following interpretative scenario may be proposed. If initial south Levantine PPNA development primarily occurred west of the desert ecotone, the natural population increase associated with Neolithic economies could ultimately have depleted local microenvironments and stretched carrying capacities to their maximum. A subsequent adaptive response may have been to expand further east, to the edges of where a "traditional" Neolithic economy could still be practiced. This does not mean the western Levant was abandoned; clearly it was not. I do not believe that all MPPNB and LPPNB populations moved to the desert fringes because the existence of large sites west of the Jordan River, such as Beisamoun, belie such a simplistic explanation. Furthermore, I do not believe that "abandonment" at sites such asJericho was necessarily immediate and complete. Certainly the PPNB component at Jericho partially overlaps with that of'Ain Ghazal, for example. Given that a partial population reshifting could have eased pressure in the western region, the "gap"between Aceramic and Ceramic Neolithic phases may be linked to this event and represents a readjustment to new economic parameters. Large sites such as 'Ain Ghazal, for example, may have served as population "magnets" from places like Jericho (see also Kuijt 1995). The consequence of this was that the former expanded at the expense of the latter, perhaps resulting in temporary abandonments at some of the western Levantine sites. A move to the east was not without difficulties, however. Such regions were more environmentally precarious. One adaptation to this ecological constraint may have been the forced consolidation of populations into larger settlements, such as 'Ain Ghazal or Wadi Shu'eib. This could have allowed for scarce resources to be pooled. Such a situation would have created social organization pressures previously unfelt but may have had the advantage of requiring more cooperation and the development of more efficient exploitation technologies and land use patterns focused on regional population centers. Certainly around sites such as 'Ain Ghazal, there is little evidence for the existence of smaller "hamlets"or support sites (Simmons and Kafafi 1988). This does not mean, however, that a similar situation existed in all areas of the southern Levant. In the southern portion ofJordan, where one might argue for an even more marginal environment, it seems that a wider range of site types existed. These included huge settlements such as Basta (Muheisen 1995; Nissen 1990) and Es-Sifyia in Wadi Mujib (Mahasneh 1995), to more modest villages such as Beidha (Kirkbride 1966, 1968), Khirbet Hamman (Rollefson and Kafafi 1985),and several in the Wadi Feinan (Adams 1991;Raikes 1980), including the superbly preserved GhwairI (Najjar 1994; Simmons and Najjar 1996, 1998). In addition, several nonvillage Neolithic sites are known, such as those in the Hisma Basin (Jobling and Tangri 1991; Vianello 19851),the adjacent Wadi Hafir (Borzatti von Lowenstern 1984), the Wadi Rumm (Kirkbride 1978), and between Aqaba and Ma'an,where nearly twenty stone circle sites datable to the PPN have been recorded (Jobling and Tangri 1991:147). Clearly, very different events were occurring in the south. Thus, the model I have developed for population aggregation is more applicable to west-central Jordan, where the diversity in Neolithic site types does not appear to be as great as it is further to the south. Confirmation of this, however, will have to await further research, since most of the southern sites (excepting Basta and Beidha) have not been thoroughly investigated (cf. Rollefson and Kafafi 1985:69). In particular, refinement of the chronological sequence is critical in order to evaluate settlement shifts thor ough time during the Neolithic in the south. It is interesting to note, however, that at least some of the large southern sites appear to contain PPNC components. PN sites, however, are rare in southern Jordan, and most of those known appear to be related to either the Jericho IX PN or the Qatifian variant ofthe Wadi Raba PN (cf. Gilead 1990;Gopher and Gophna 1993:318, 337; Goren 1990). It is apparent that the entire range of Neolithic occupation, from PPNA through PN, occurs in southern Jordan. As with central Jordan, however, only limited evidence exists for the earliest (PPNA) occupation. What is particularly intriguing about the south is that both villages and more limited activity sites occur during the PPNB. This has prompted some authors (e.g.,Jobling and Tangri 1991:147) to suggest that the PPNB adaptation here was one characterized by seasonally mobile hunters and gatherers, as suggested for similar sites in the Sinai (e.g., Bar-Yosef 1981b; Tchernov and Bar-Yosef 1982). Many such sites, however, may also represent logistical camps away from villages or pastoral activity. Garrard et al. 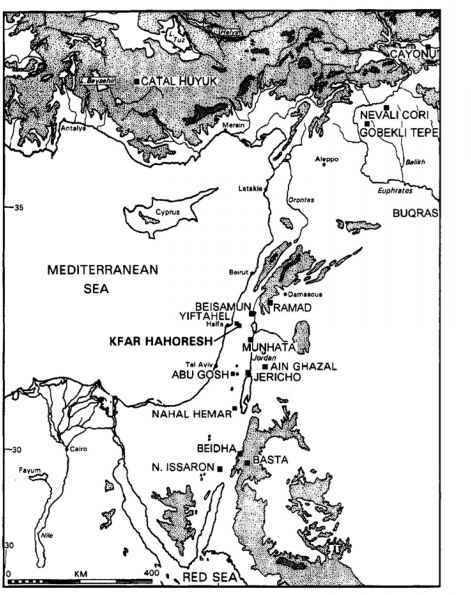 (1996:221) note that may of the Late Neolithic inhabitants in the more arid portions of the southern Levant made use of a "pastoral package" that " . , . would have provided a useful risk-buffer for those engaged in marginal farming and hunting." Certainly the identification of large PPNB (e.g., Basta, Es-Sifyia) and small (e.g., Ghwair I) villages clearly does not support such a model. In any event, it is clear in the PPN/PN of the southern Levant that population movement was dynamic, complex, and must be interpreted in a regional context. It is equally clear that the huge settlements, such as 'Ain Ghazal and Wadi Shu'eib, changed dramatically at the start ofthe PPNC and PN and were, ultimately, abandoned. It is useful to examine some possibilities as to why this may have occurred.